This is a guest post from John Tippets, author of Hearts of Courage. He also runs presentations based on the story for interested groups, conventions and meetings. You can contact him at johntippets[at]yahoo[dot]com. On January 5, 1943 , an airplane with six onboard goes missing in remote Southeast Alaska with the pilot’s only radio message of “one engine has conked out, expect trouble.” The winter weather is extreme, searchers find no signs of the Lockheed-Electra aircraft, and all are presumed lost. One of those passengers was Joseph Tippets, age 29, of Anchorage , Alaska , an employee of the Civil Aeronautics Administration, and the first branch president of the small Latter-day Saint Anchorage congregation. Joseph’s wife, Alta, with her two-year-old son in Anchorage does not give up hope and is a source of strength and encouragement to others. On February 3, the crew of a small coast guard vessel on a routine patrol in Boca de Quadra was stunned to discover two starved and freezing survivors of the missing plane. One of those was Joseph Tippets. 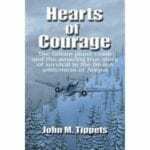 Hearts of Courage is the story of Joseph Tippets’ experiences over those twenty-nine days and his subsequent efforts to help rescue the two injured passengers still stranded in their wilderness camp. Told largely in Joseph’s own words, this is a story of courage, determination, faith, and prayers answered. It is an aviation history story, a survival story, and a love story. “We all remember the almost incredulous joy and amazement we experienced on February 3 upon hearing that two survivors had been found, including our good friend and coworker, Joseph H. Tippets. After a month of privation and suffering, the fact that even four of the six on board the ill-fated plane survived the long, miserable month almost taxes our imagination, and proves indeed that faith and hope and courage and endurance have tangible rewards. In testing out the boat again, and after making a few more repairs, we became somewhat bold. We were on a point of land jutting out into the bay, which had a narrow outlet to the sea. We felt if we could make our way out to the open water, we would have a chance to get to Annette Island or find some inhabited place where we could get help. On Saturday (day 25), we started out. We knew our chances were slim, but desperation and concern for our two comrades back in camp forced us to make a try. We sat in the bottom of the boat, actually sitting in the icy cold water. The boat leaked almost as fast as we could bail. We bailed with one hand and paddled wearily with the other for about an hour. There was only one inch of space on the side of the boat above the water. After a couple hundred yards, we had to run the boat to shore and tip it over to empty it, and then start again. We should not have undertaken that trip. Before we left, I had a clear feeling that we should not go. It was more than a feeling, it was a warning. But we set out and, as a result, we were headed for disaster. After we’d been rowing about two hours, a violent storm began to develop. The sky turned black and the waves got higher and higher, heavy swells forcing us to bail even faster to keep afloat. Nearly full of water, the boat capsized and we were dumped into the bay, chilling to the bone in the bitterly cold water. Cakes of ice were floating all around us. We lost our overcoats, cooking utensils, everything but the clothing we had on and our rifle. Our clothing dragged us down and the waves tossed us around. Just for a moment, I lost all faith and was angry with the Lord. Why, I thought, have you let me go through so much, for so long, only to drown here today? But, almost as I completed that thought, with my head barely above water, I found my feet touching the bottom. Pushing off and trying to swim, we kept together and made it the short distance to the shore. But we found only rocky cliffs. The waves were dashing us against the slippery rocks and then drawing us back into the water. We could not find a hold. Our hands were so cold we could not hold on when we did get a chance. It took us more than a half hour to finally grasp a ledge and pull ourselves fully out of the water. Fortunately, we had kept our matches in a bouillon cube tin sealed with adhesive tape and they were dry. We made a small fire and tried to warm our feet. It was like trying to thaw out a piece of ice. We then set out to try and return to our camp, encouraging each other as we went. We did find the remains of our boat washed up on the shore, beaten against the rocks and smashed. Miraculously, under the seat, I found a still preserved bundle with my scriptures and other personal papers. We were able to shorten our return hike by a mile or more as ice at the north end of Weasel Cove was thick enough to hold our weight. We crossed there, and then worked our way back to our campsite near the point. It had been twelve hours since we had left. As we drew near the shelter, we saw a coast guard cutter circling the bay. Wildly, we ran toward shore, yelling, stumbling, and falling in desperation to get them to see us. But the boat went up the channel and right past Weasel Point before disappearing into the fog beyond. Some friends and I have been running a series of gift ideas across our blogs. I already proposed a Breitling Navitimer watch and now it’s my turn again. This time, I’d like to suggest some books and a DVD that any pilot will love. One Six Right. If you want a single film that captures the joy, romance, history and excitement of flying, this is it. It is a documentary about Van Nuys Airport in LA; but that’s like saying Citizen Kane is a film about a sled. Check out this clip on YouTube. Backroom Boys. This is a charming little history of the British boffins who tried to take the UK to the stars on a shoestring and almost succeeded. Read a longer review on my writing site. Boyd. The biography of John Boyd, a US fighter pilot who revolutionised aerial warfare, instigated the F16 fighter and inspired the winning strategy of the first Gulf War. Read a longer review. Carrying the Fire. Michael Collins’s book is the best of the Apollo astronaut biographies and, I suspect, the only that is not ghost-written. Read a longer review. Project Orion. Imagine if you could reach Mars in a few weeks in a 4,000 tonne space cruiser powered by nuclear bombs. This is the history of the nuclear scientists who designed such a craft in the 50s. Read a longer review. Absolute Altitude. The story of a British journalist who decided to try to blag his way around the world in the cockpits of different aircraft. Sadly, I don’t think it would be possible today because of 9/11. So it is also a testament to a more innocent era. Read a longer review. I just watched Flyabout, a movie by Monika Petrillo about her flight around Australia with her father. It is a partly a film about flying but also a film about family relationships and personal discovery. It is inspired by the Aboriginal tradition of a ‘walkabout’ and it has something of that ‘anything may happen’ mood. I enjoyed it very much and recommend it to any pilot.